Level 2 is now finished and the logs are current for the newest file. - Changed Pathing System for enemies. I had broken it trying to do something else but I reworked the entire system so that it is better and fixed a lot of bugs. 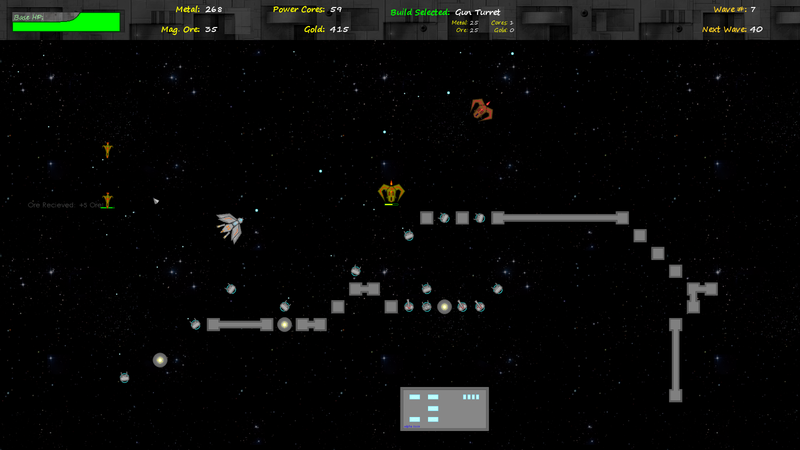 - Added in walls that adjust their sprites based on the walls around them to connect forming a single large wall. - Lots of other little bug fixes. The first log seems like little things but it set the groundwork for the work I did today which will be coming up soon in the next release. - Fixed enemy pathing (again). There were still a lot of bugs with the path finding system, particularly when you walled off your base entirely. I had made the system too complex, so I simplified it and it works a lot better. 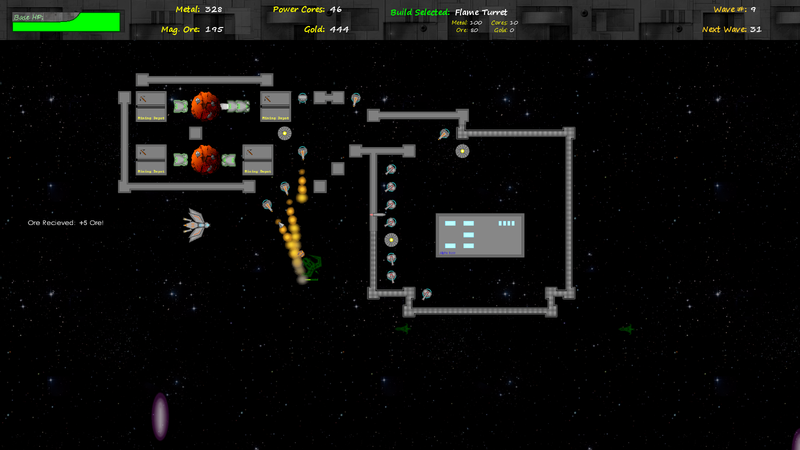 - You can no longer damage buildings with your ship weapons. Now that the destroyer is added, it is unnecessary and you don't have to be so careful where you shoot. - Increased Player Basic Attack Damage by 50%, reduced Player Basic Attack Cooldown by 50%. The player ship should be doing significantly more damage. - Increased turning speed in short range mode for Player Ship, increased max flight speed and acceleration in long range mode. - Added Red color to the Item Builder Costs on the GUI when you don't have the required amount. - Generator1 range reduced from 600 to 400. - Mousing over Asteroids now shows you how much Ore is remaining. - Asteroid Ore reduced from 1000 to 500 per asteroid. - Block Wall: HP reduced from 100 to 50, cost increased from 10 to 20 Metal. - Steel Wall: HP reduced from 250 to 120, cost increased from 20 to 40 Metal. - Gun Turret: Rate of fire reduced. 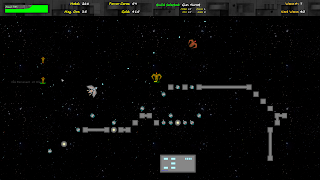 - Missile Turret: Rate of fire reduced. Ore cost increased from 40 to 50. - Enemy 3: Increased level 1 HP from 450 to 550. - Reduced gold drop amount from Tier 3 enemies slightly. All in all these changes make level 1 a bit harder, but definitely doable. You should be trying to build walls to path enemies around your turrets or they will do too much damage to your base. I increased the metal cost of walls so that you can't just wall off your entire base and keep rebuilding. I may reduce the cost a bit. A lot of the new patch is balance changes and hopefully I'll have Level 2 out and some new buildings, generators and turrets to try out! - I finished another section and uploaded the new file. - Level 2 is finished. - Lots of bug fixes, Miners now select a new asteroid instead of blowing up if one is available. - Generators now power a specific number of turrets. Basic Generators power 3 nearby turrets and Extended Generators power 5 nearby turrets and have a higher range. - Lots of other little things but level 2 is active in the newest file! 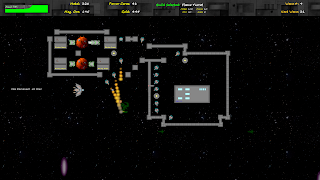 - Sabotage enemies that target your generators and turrets with massive damage.